Xiaomi is back with another flash sale strategy and this time, it’s Mi Band. And the best part is that you can grab an Mi Band for just Re. 1 on May 5th from Flipkart. And Mi Band is really an amazing wearable gadget, which you can use with your smartphone. You can measure how many steps you have taken, sync and enjoy the 30 days battery backup of the Mi Band. So, here’s what you need to do. 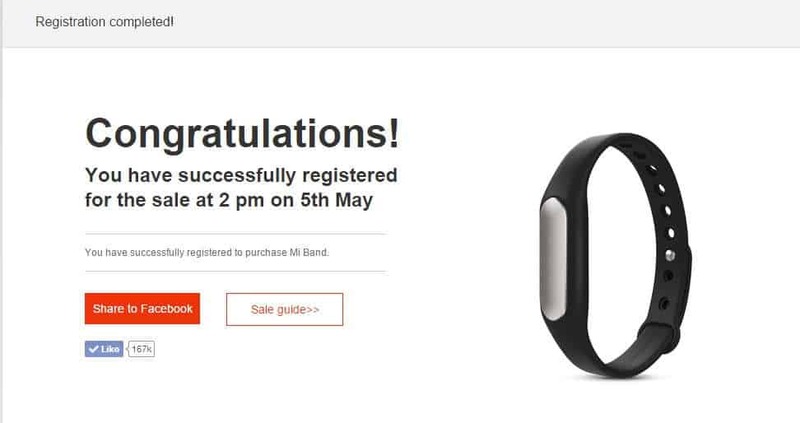 Just you need to register for the Mi band sale on May 5th from here. Log in with your Mi account, add your address and register. Be sure to log onto Flipkart before 2 PM on 5th of May and grab yours fast, because only first 1000 of the Mi Bands will be sold out for Re. 1. And here’s the list of T&C which Xiaomi has posted on the official Facebook page. Registration period on mi.com/in from 28/4 2PM to 4/5 2PM. Re. 1 Mi Band Special Sale will be on 5/5 2PM. Registering gives you a chance to purchase (while stocks last) during this sale. Each registered Mi Account is only entitled to purchase of one Mi Band (black strap). Mi Band purchased at Re. 1 will be entitled to free delivery. Limited stocks available, and adding to cart does not guarantee purchase. Please proceed to checkout to place your order for early confirmation. Items in shopping cart will be cleared after 2 hours. Checking out and placing orders promptly within this time period is highly recommended. Do share or tweet your purchase on the Mi India Facebook page (www.fb.com/MiIndiaOfficial) or Mi India Twitter account (@MiIndiaOfficial) for a chance to earn additional surprise gifts. This Mi Band Preview sale is deemed a special sale. No refunds will be allowed. All queries on this preview should be directed onto the main Timeline on the Mi India Facebook page (www.fb.com/MiIndiaOfficial) or Mi India Twitter account (@MiIndiaOfficial). So, just register fast and be sure to grab your Mi Band as soon as possible.